Immigrating to a completely foreign country and culture is a challenge that offers no easy solutions. Trying to take with you a vocation as strenuous and demanding as farming is an even greater challenge. But even while busily establishing her new life in Massachusetts, Seona pined for the farm she had known in Cameroon. Although farming in New England was much different from the year-round growing weather in her native country, thanks to the help of New Entry, Seona planted a seed of ambition in her new home soil. “I just chanced [upon] seeing a [New Entry] sign in downtown Lowell,” Seona said, grateful for the lucky encounter which enabled her to pursue her farming interests in earnest. Now, six years later, Seona has become a successful farmer. She currently is renting land in Groton and looking for a plot somewhere a little bit closer to Lowell where she can establish herself permanently. Seona credits New Entry with helping her in numerous aspects of the farming process, especially crop planning, business planning, and finding a market in which to sell her produce. After graduating from New Entry's Farm Business Planning Course, Seona began her farming endeavors on one of New Entry's incubator training farm sites in Dracut, Mass. “They helped with so many things,” says Seona. 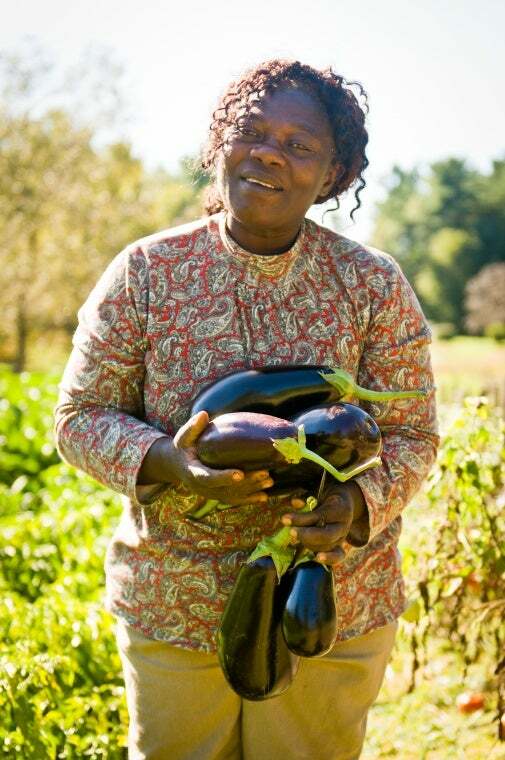 Seona has grown a variety of produce over the last few years, but her greatest success has come with tomatoes, eggplants, collard greens, and cabbage. For this year's upcoming growing season, Seona would like to continue building on her success with her group of staple plants, as well as expand into growing varieties of peppers and even bok choy. Outside of the growing and planting process itself, Seona participates in the World PEAS Food Hub. She states that not only is it good to be a part of because she is able to spread her wealth of healthy, organic and locally grown produce to the immediate community, but she also doesn't have to bring any vegetables back home with her! Seona believes it truly is “a great idea.” Whatever produce she doesn't sell through World PEAS or directly to members of several immigrant communities in Lowell, Seona loads into her minivan and unloads at the Lowell farmers' market. Over the past six years, Seona has not lost her desire or passion for farming in the slightest. She believes it truly is vital for communities close by and across the country to buy and consume fresh, organic produce. As for herself, Seona says that her favorite part of farming, besides the memories it brings back of Cameroon, has been the process of working in the field and harvesting her plants. She'll tell you about it if you ask: just go to the Lowell Farmers' Market on Friday afternoons and look for the least flashy display and the friendliest face. That'll be Seona.